Originally appeared in The Australian Jewish News. 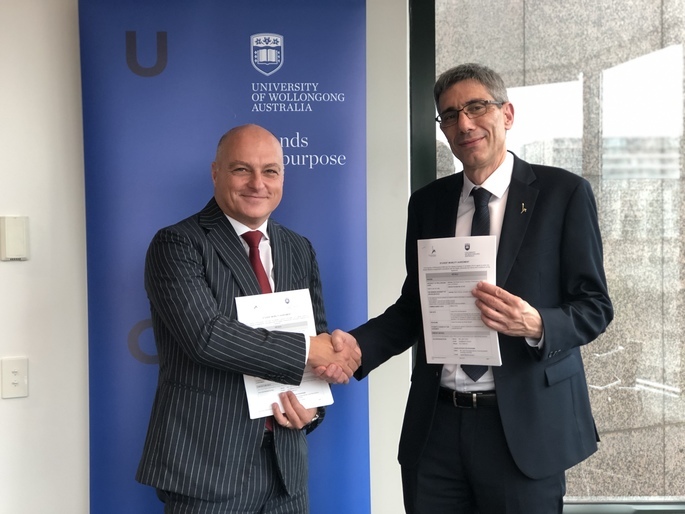 The University of Wollongong (UOW) has entered into an agreement with the Hebrew University of Jerusalem (HU) to facilitate student exchanges between the institutions. Professor Alex Frino (left) and Professor Oron Shagrir after signing the agreement. The deal was signed in Sydney earlier this month between HU vice-president for international affairs Professor Oron Shagrir and UOW deputy vice-chancellor Professor Alex Frino. “We are honoured to be opening up exchange opportunities for students with Israel’s highest ranked university,” Frino said. Shagrir, who was in Australia to discuss collaboration opportunities with local universities, said, “Wollongong is up-and-coming as a university. AUJS UOW president Dana Segal also lauded the deal. “AUJS UOW is excited about the exchange opportunities this partnership will bring to both Jewish and non-Jewish students. Israel’s educational institutions stand with some of the best in the world and its vibrant innovation ecosystem offers students a truly world-class experience,” she said. While in Sydney, Shagrir also visited the University of Sydney to discuss expanding an existing exchange agreement, as well as Macquarie University, where discussions focused on a future joint PhD program. He also presided, in Melbourne, over the signing of an agreement that will see the HU and the University of Melbourne offer a joint doctoral program. “Melbourne is a great school, ranked first in Australia and it’s very high by any standards in the world. So we will be very happy to launch this program,” he said. Speaking to The AJN, Shagrir stressed the importance an innovative culture plays at HU, noting that Mobileye, Briefcam and OrCam were all developed there. “In order to maintain this standard we doubled the amount of computer science students we train at the university, and we opened a new innovation centre that will train students,” he said. HU’s innovation culture will be on show during NEXUS:ISRAEL Innovation Forum, an exclusive four-day program being held in Tel Aviv just prior to HU’s board of governors’ meeting in June. More information about NEXUS:ISRAEL can be found at austfhu.org.au.